The Options Page can be installed by purchasing a license for ACF PRO. On payment, you will receive a receipt from ACF and a user account allowing access to your downloads. Once ACF PRO is installed, enter your license key to enable plugin updates. The Options Page may also be installed by purchasing a license for this add-on. On payment, you will receive a receipt from ACF and a user account allowing access to your downloads. Once the add-on is installed (requires the free version of ACF to also be installed) you will not need to enter any license key information. The Options Page add-on is available within ACF PRO (new) or as a plugin (old). ACF PRO is an all in one plugin containing ACF version 5, the Repeater field, the Gallery field, the Flexible Content field and the Options page! Premium add-on plugins have been replaced by ACF PRO. They are compatible with the free version of ACF, but will not receive new updates. Smarter, faster and more refined. The next generation of ACF is now available! 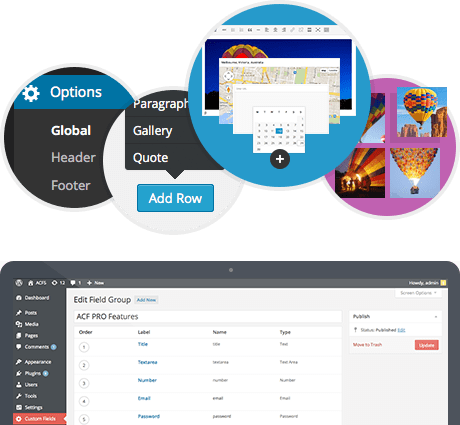 ACF PRO combines the feature packed ACF version 5 plugin plus all 4 premium add-ons together in the most powerful and attractive version of Advanced Custom Fields ever!